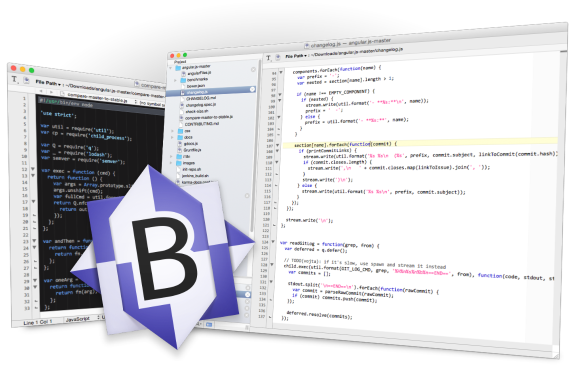 I'm a big fan of BBEdit, as a Mac user, it's my text editor of choice for all but Xcode/C++ programming. David, Jenn, and I used BBEdit on Thimbleweed Park. I even created a custom syntax coloring scheme for our proprietary language and David added some great keyword based auto expansions. It's feature rich and has everything a coder could want. Except for one thing and it drives me crazy to the point that each time I need to do it, it puts a stain on what is by all other accounts, a perfect editing experience. In Xcode, I can select a word (or words), right click on it and the pop-up menu shows this. It's my bread-and-butter for searching. I can't do this in BBEdit. The closest I can come is selecting the word, then hitting ⌘-E to Use Selected Text In Find, then ⌘-G to bring up the Search In Project window and click on Find. This is cumbersome as it requires me to move my hands to the keyboard. (yes, I know super programmers only use the keyboard, but clearly, not all of us do). If I could get BBEdit to add just one thing, it would be this. Then it would be perfect. During Thimbleweed Park I wasted several afternoons trying to hack this in with macros, etc. P.S. To head off the griping/astonishment I get whenever I post a screenshot of my text editor... yes, I enjoy programming with a light/white background. But only for C++. For other languages (in BBEdit), I use a dark/black background. As I am switching between the two all day long, I find my brain needs to strong visual distinction to differentiate the two. On Windows I use Notepad++ for almost everything. I love how fast and powerful it is. It also lets me open big (1 GB+) text files, which can be handy if you want to know the schema of a csv file. On Linux I sometimes use vim to edit config files and scripts. I know it's very powerful and extensible, but it's hard to remember all the keyboard commands so I don't use it much. I can get close to this with a couple of key strokes... ⌘-E, Shift-⌘-F (multi-file search), then click on the Find All button or Return. I just have to make sure the write files are included in the search (which I rarely have to change, unless I'm switching between projects). I could probably create a single-key macro to do this on the Mac as well. On the other hand, isn't there also something pleasant about wasting an afternoon trying to hack a thing like that together? Even when it leads to nothing. Have you ever tried TextMate? It's the best text editing experience I've found. I don't use a Mac now; my old iMac is one of those powered by a hand crank and I'm waiting Tim Cook lowers their price (I have a feeling that it will be soon), but I think what you say can be easily done with ⌃W (select word) and ⇧⌘F (find in project). If you don't know TextMate, give it a try, you will be surprised. Using BetterTouchTool, you can associate a key sequence to a shortcut, for a given application. I use this all the time for apps that don't allow customizing shortcuts. You should give VSCode a try: Shift-⌘-F and Enter. There are "Keyboard Maestro" or "Automator" app for Mac. After configuration, you simply click on one icon, and it does the magic for you, in the way you instructed it. Can't you extend BBEdit with (own) plugins or scripts? If yes, you could develop the needed feature yourself? Can you expand on your proprietary language, please? I don't really have anything to add other than that I was displeased with all the distraction-free editors out there, so I just made my own. It only took a couple of days to get all of my must-have features (set column width, brown noise player, toggle status bar, statistics, bookmarks, just to name a few), and I'm a terrible programmer. I admit I don't know what kind of features you need to work on a commercial project like TP, but I'd probably just fork something on GitHub. I spend so much time writing that it made sense. I use TextMate on a Mac with a custom language bundle I've created and maintained over the years for my assembly language projects. 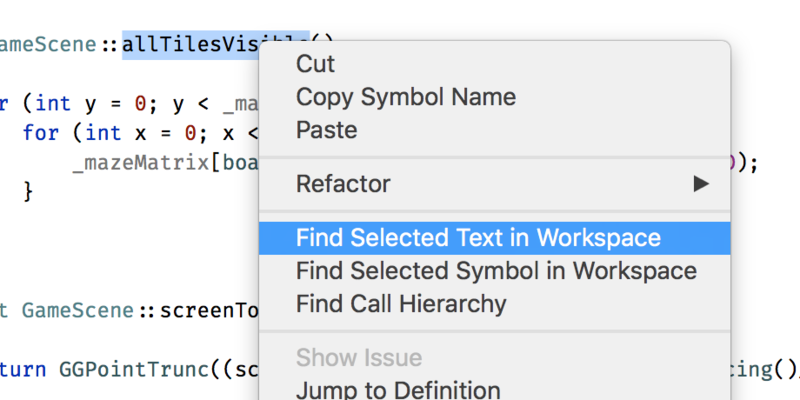 It's trivial to add context-menu commands such as "Find in project" in TextMate, but I just use CMD+E (select word) and CMD+SHIFT+F (search in project). The most awesome thing is that CMD+E seems to be system-wide, so I can easily do it on a Terminal window in the debugger and then CMD+TAB to TextMate to search for the word in my symbol table file. Looks like your request has been taken granted, we have that context option now (version 12.1.3 (410060, 64-bit)). Also, thanks for pointing out that keyboard shortcut, it is super useful. What is five + three?